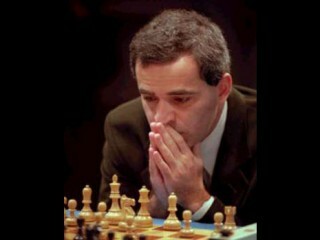 Garry Kimovich Kasparov (born April 13, 1963) is a chess grandmaster and the strongest (highest rated on the FIDE April 2004 list at 2817) chess player in the world. He was born as Garri Weinstein in Baku, Azerbaijan. He first began the serious study of chess after he came across a chess problem set up by his parents and proposed a solution to it. When he was 12, his father died, and he adopted his mother's surname. His mother Klara is an Armenian woman whose surname is Kasparian, and "Kasparov" is the slavicized version of this name. Kasparov trained at Mikhail Botvinnik's chess school. His talent and potential were clear when he won the Soviet Junior Championship at Tbilisi in 1976, scoring 7 points out of 9. He was 13 at the time. He repeated the feat the following year, demolishing the field with a score of 8.5/9. In 1978 Kasparov participated in the Sokolsky Memorial tournament at Minsk. He had been invited as an exception, but took place, and also became master. Kasparov has repeatedly said that this event was a turning point in his life, and that it convinced him to choose chess as his career. "I will rememeber the Sololsky Memorial as long as I live", he wrote. He has also said that after the victory, he thought he had a very good shot at the World Championship. Garry's rise up the FIDE ranking order was nothing short of phenomenal. Starting with an oversight by the Russian chess federation, Garry Kasparov participated in a Grandmaster tournament in Banja Luka while still unrated (the federation thought it was a junior tournament). He emerged from this top-class encounter with a provisional rating of 2595, enough to catapult him into the top group of chess players. The next year, 1980, he won the World Junior Chess Championship in Dortmund, West Germany. It was clear from early on that Garry had the playing strength to match the then current world champion Anatoly Karpov - a firm favourite of the Russian Chess Federation. But first Garry had to pass the test of the Candidates Tournament to qualify. His first Candidates match was against Alexander Beliavsky, from which Kasparov emerged surprisingly victorious (Beliavsky was an exceptionally tough opponent). Politics threatened Kasparov's next match against Viktor Korchnoi which was scheduled to be played in Pasadena, California. Korchnoi defected from Russia in the late 1970s, and was at that time the strongest non-Soviet player. Various political manoeuvres prevented Kasparov from playing Korchnoi, and he forfeited the match. This was resolved by Korchnoi's generous gesture of allowing the match to be replayed in London. Kasparov won. Kasparov's Candidates final match was against the resurgent Vassily Smyslov (who won his match against Huebner by the spin of a roulette wheel!). Smyslov was the seventh world champion in 1957, but later years saw his willingness to fight for wins greatly diminished. This posed no problems for the youngster from Baku who registered a comfortable win. The 1984 World Championship match between Anatoly Karpov and Garry Kasparov had its fair share of ups and downs, as well as the most controversial finish to a competitive match ever. Karpov started off in very good form, and within a dozen games Kasparov found himself 4-0 down in a "first to six wins" match. Fellow players predicted a 6-0 whitewash of Kasparov within 18 games. For Karpov, the result so far would go some way in exorcising the ghost of Fischer's Candidates results in 1970, and would further cement Karpov as a true World Champion. Kasparov dug in, with inspiration from a Russian poet before each game, and battled with Karpov into seventeen successive draws, Karpov duly won the next decisive game before Kasparov fought back with another series of draws until game 32, Kasparov's first win against the World Champion. At this point Karpov, twelve years older than Kasparov, was close to exhaustion, and not looking like the player that started this match. A few games later Kasparov won another two games to bring the scores to 5-3 in Karpov's favour. Then the match was ended without result by Campomanes - the head of FIDE, and a new match was announced to start a few months later. The termination of the match was a matter of some controversy. At the press conference at which he announced his decision, Campomanes cited the health of the two players, which had been put under strain by the length of the match, yet both Karpov and Kasparov stated that they would prefer the match to continue. Karpov's statement was difficult to believe: he had lost 22 pounds over the course of the match and had been hospitalized several times. Kasparov was in excellent health and extremely resentful of Campomanes' decision, asking him why he was abandoning the match if both players wanted to continue. It would appear that Kasparov, who had won the last two games before the suspension, felt the same way as some commentators - that he was now the favourite to win the match despite his 5-3 deficit. He appeared to be physically stronger than his opponent, and in the later games seemed to have been playing the better chess. As Dan Heisman humorously commented on this confusing situation: "Kasparov was losing the match to Karpov 5-3 but found it stopped by FIDE, Kasparov said he was winning because Karpov was only ahead 5-3. Karpov, from his hospital bed, protested that he felt fine and wanted to continue, but the doctors were not letting him." Whatever the reasons for the abandonment, the match became the first, and so far only, world championship match to be abandoned without result. Kasparov had made a new enemy in Campomanes, and the feud between the two would eventually come to a head in 1993 with Kasparov's complete break-away from FIDE. The second Karpov-Kasparov match in 1985 was organised as the best of 24 games, first player to 12.5 points would claim the title (in the event of a 12-12 draw, the title would go to Karpov as the reigning champion). Kasparov showed he had learnt some valuable lessons in the previous match, and although the score was quite even down to the final wire, a few spectacular games involving the Sicilian defence secured the World Championship for Kasparov at the tender age of 22. This broke the existing record of youngest winner held for over twenty years by Mikhail Tal (he was 23 when he beat Botvinnik in 1960). Kasparov cemented his authority at the top of the rating ladder with a series of fine tournament performances as well as defending his title three times against his arch-opponent Karpov. With the World Champion title in his grasp, Kasparov switched to battling against FIDE - as Bobby Fischer had done twenty years earlier, but this time from within FIDE. He created an organisation to represent chess players, the GrandMaster's Association (GMA) to give players more of a say in FIDE's activities. This stand-off lasted until 1993, by which time a new challenger had qualified through the Candidates cycle for Kasparov's next World Championship defence. The world champion and his challenger (Nigel Short) decided to play their match outside of FIDE's jurisdiction, under another organisation created by Garry Kasparov called the Professional Chess Association (PCA). This is where the great fracture on the lineage of World Champions happened. The first minor fracture happened in 1975 when Fischer did not defend his title and Karpov became the official world champion by default. Kasparov and Short were ejected from FIDE, and they played their well sponsored match in London, with Kasparov winning heavily. FIDE set up their "World Championship" with the loser of the Candidates final, Jan Timman, and previous World Champion Karpov. So Kasparov held the PCA World Chess Championship, and Karpov held the FIDE World Chess Championship. Kasparov defended his title in 1995 against the Indian superstar Viswanathan Anand, before the PCA collapsed (Intel, one of the major backers, pulled out). Kasparov tried to organise another World Championship match, under yet another organisation, the World Chess Association (WCA) with Linares organiser Rentero. This climaxed into a match between Vladimir Kramnik and Alexei Shirov, which Shirov won against all expectations. The WCA collapsed, however, when Rentero admitted the funds required and promised never materialised. This left Kasparov stranded, and yet another organisation stepped in - BrainGames.com, headed by Raymond Keene (who was also involved in bringing Kasparov to London for his replayed Candidates match against Korchnoi, half of the first Kasparov-Karpov match, and the Kasparov-Short PCA match). No match against Shirov was arranged, and talks with Anand collapsed, so a match was instead arranged against Kramnik. This match, Kasparov-Kramnik, took place in London during the latter half of 2000. A well prepared Kramnik surprised a lacklustre Kasparov and won a crucial game 2 against Kasparov's supposedly invincible Grünfeld Defence. Kramnik emerged victorious, and for the first time in sixteen years Kasparov had no world championship title. Kasparov proved in 2001 that he was still the strongest tournament player in the world with his fine performance in the Corus Chess Tournament at Wijk aan Zee. As part of the so-called "Prague Agreement", masterminded by Yasser Seirawan and intended to reunite the two World Championships, Kasparov was to play a match against the FIDE World Champion Ruslan Ponomariov in September 2003. However, this match was called off after Ponomariov refused to sign his contract for it without reservation. As of May 2004, there are plans for Kasparov to play a match against the next FIDE champion (to be determined in June-July 2004), although whether these plans will come to fruition remains to be seen. In the meantime, Kasparov continues to play in tournaments, with good results on the whole. Kasparov has written a number of books on chess. In 2003 the first volume of his projected five volume work Garry Kasparov on My Great Predecessors was published. This volume, which deals with the world chess champions Wilhelm Steinitz, Emanuel Lasker, Jose Raul Capablanca and Alexander Alekhine, and some of their strong contemporaries, has received lavish praise from some reviewers (including Nigel Short), while attracting criticism from others for historical inaccuracies and analysis of games directly copied from unattributed sources. Despite this, the first volume won the British Chess Federation's Book of the Year award in 2003. Volume two, covering Max Euwe, Mikhail Botvinnik, Vassily Smyslov and Mikhail Tal appeared later in 2003. In February 1996, IBM's computer chess program "Deep Blue" defeated Kasparov in one game using normal time controls, in Deep Blue - Kasparov, 1996, Game 1. In November 2003, he engaged in a four game match against chess playing computer program X3D Fritz (which was said to have an estimated rating of 2807), using a virtual board, 3D glasses and a speech recognition system. The first was a draw, X3D won the second after Kasparov blundered when short of time, Kasparov won the third, and the last game was a draw. The X3D Man-Machine World Chess Championship match ended in draw. Kasparov receives $175,000 for the result and takes home the golden trophy. (Although since it drew the match X3D Fritz said it was going to store a virtual reality copy of the trophy for itself.). Kasparov continued to criticize the blunder in the second game that cost him a crucial point. He felt that he had outplayed the machine overall and played well. "I only made one mistake but unfortunately that one mistake lost the game." View the full website biography of Garry Kimovich Kasparov.